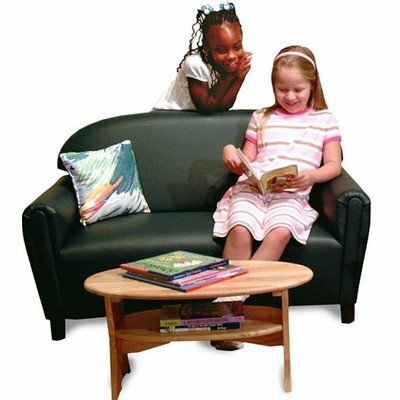 School Age Premium Vinyl Upholstery Sofa - Teal: Our "just like home" furniture units are built with sturdy hardwood frames, comfortable dense foam then carefully upholstered in premium vinyl covering. The vinyl upholstery offers the appearance and comfort of soft leather; yet it's durability and easy clean-up make it "just right" for active youngsters. Assembled in the USA by craftsmen who take pride in building furniture by hand. All Brand New World furniture units meet the safety guidelines set by the CPSC, ASTM, CPSIA and CCPSA. Our school age units are a perfect place for older children to sit back, relax, or just "chill-out" - a little bigger and sized just right. The 3.5" legs make the seat height a comfy 15". The sofa measures 45"L x 21"D x 28"H. Ages 6 years & up. One year warranty. Free of flame retardants. Premium Vinyl Upholstery - Teal. Sofa dimensions are 45"L x 21"D x 28"H. Weighs 42 lbs. Seat height: 15". Legs: 3.5". Ages 6 years & up.